We are currently reducing our herd - all horses except Sterling Silver and Bajara Silver are for sale. Please email me for info about the broodmares for sale. We are also willing to breed lease our broodmares. - "Charley" is a very high percentage Shagya with no arabs in the first 4 generations. This was Nicolette's last foal at age 24. Friendly disposition. His 3/4 brother Revelation passed the 70 day stallion test. I expect him to mature 16+h. At 6 days of age he was already attempting to jump his dam while she was lying down, so I think he might have a career in eventing. 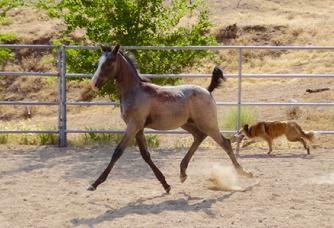 His trot is starting to show beautiful extension. 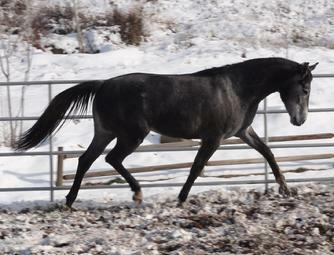 Brise is a stunning Shagya mare, 15.3h. 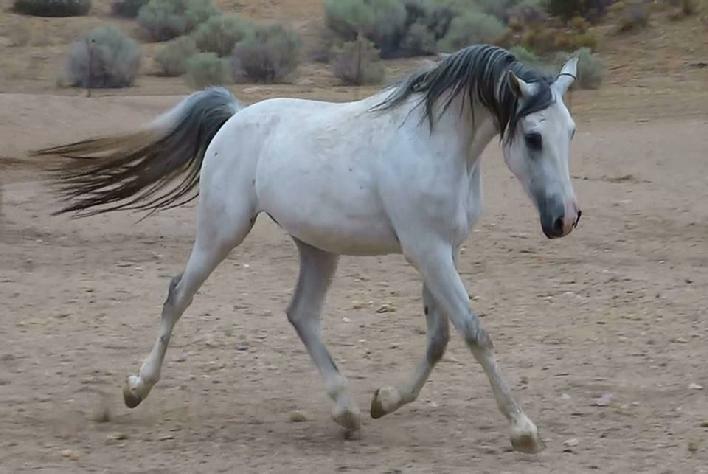 She is ISG Shagya approved and received a "10" for her trot. 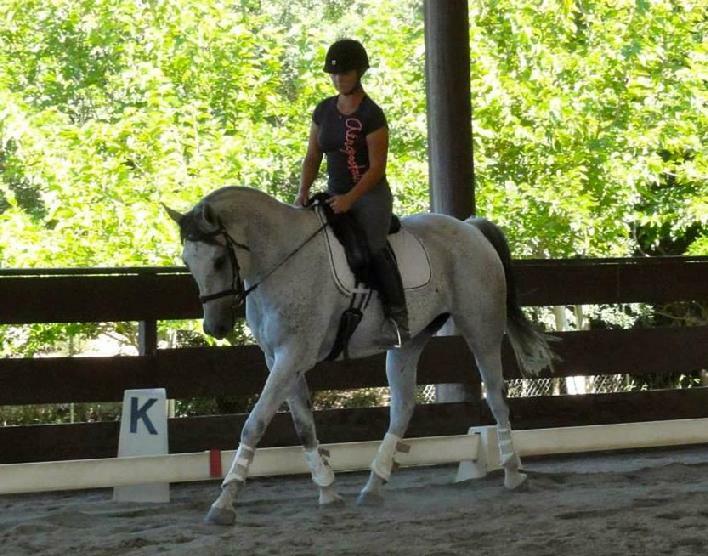 She is also Trakehner approved with a score of 54. 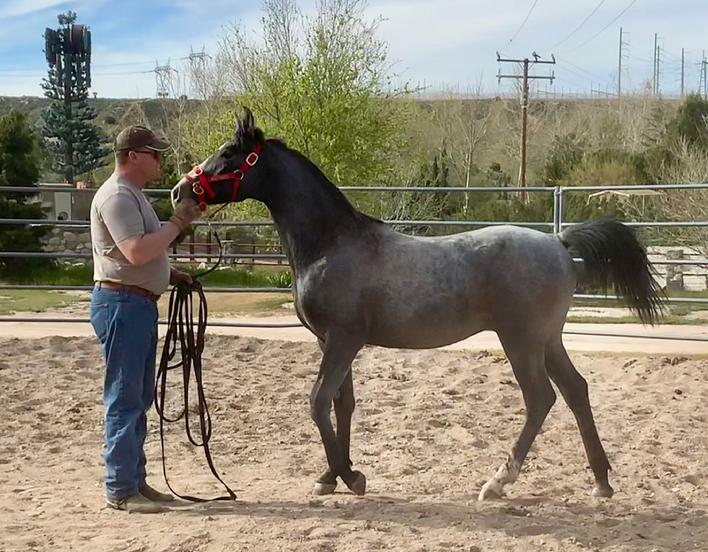 Judge Brad Kerbs stated she is the kind of mare needed in the Trakehner breed. She has been my primary riding horse and I am only selling due to downsizing. She is a proven broodmare and I have done 2 LD's on her - coming in 4th place on only her second ride! 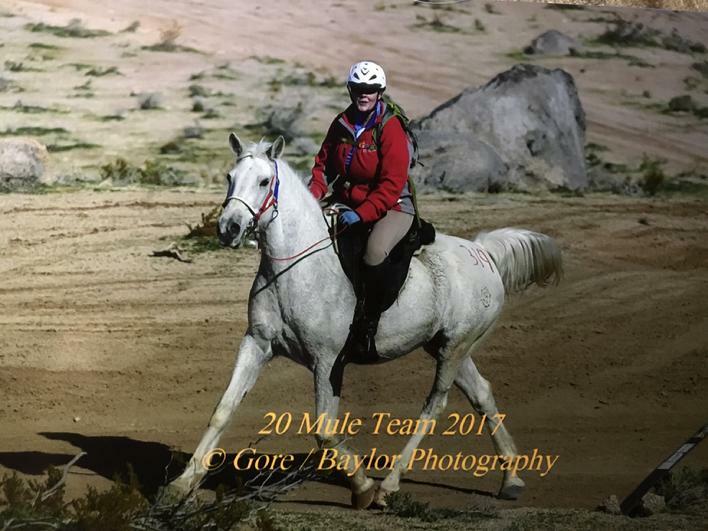 Several of her half siblings have been doing quite well in endurance - finishing Tevis and placing first in the Vermont 100. 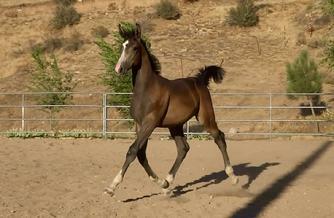 She has beautiful movement, a big trot with excellent extension and would do well in dressage. Her sire Sarvar was a dressage horse. She has a fabulous, sweet, gentle personality, and is an easy keeper. Tina is a proven broodmare, having had 4 foals so far. She is an excellent mother. Tina has beautiful movement, a big trot with nice suspension and has also shown excellent free jumping ability. She is under saddle and has completed 1 LD. She was a twin, so only stands 14.3 h, but has a deep heartgirth and rides like a much bigger horse. 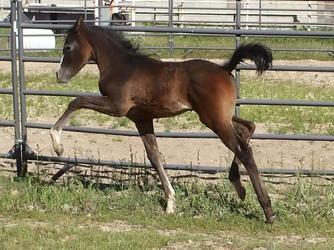 Her parents were both 16.1h and she throws 16h foals. She is a powerhouse and I thinks she'd do extremely well in the endurance world, as well as eventing, jumping or dressage. Her grandsire O'Bajan I-10 was a successful dressage horse (and quite the jumper!) as was her great grandsire, the Elite Shagya stallion Balaton. 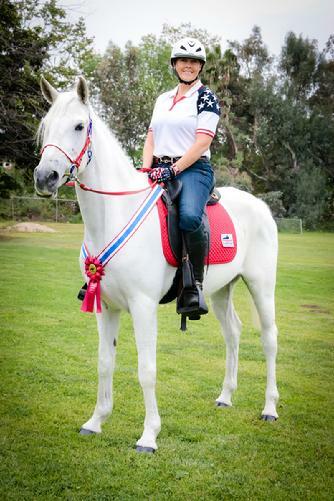 After only 10 months under saddle I rode Tina in the Rose Parade. She did beautifully. The only reason I am selling is I am drastically downsizing my herd and not breeding much anymore. She would be an asset to any breeding program! - Sire Songline was the 2010 Bundeschampion, champion at his 2 yr old inspection in Germany and sold for a record 320,000 euros. 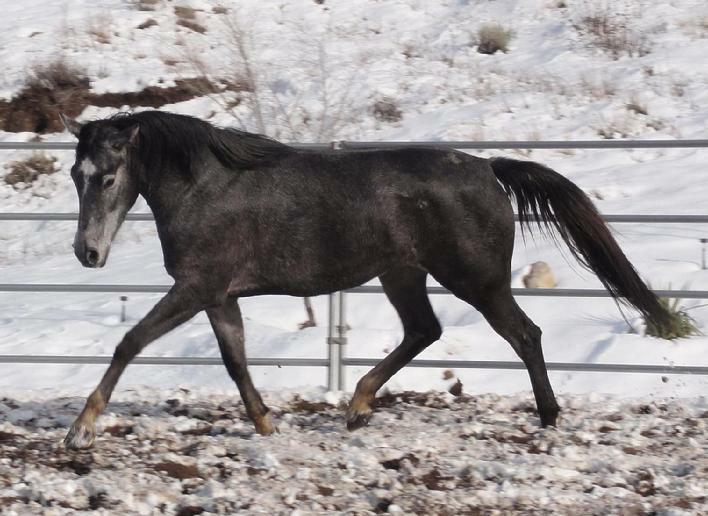 Gator is a very sweet tempered stallion prospect, quite easy to handle. 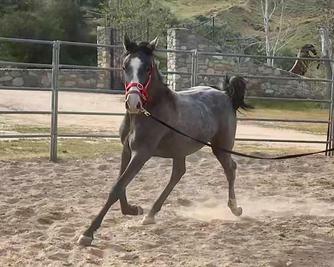 He is a beautiful mover, uphill with a balanced canter, trot with excellent suspension. He was bred to be an eventer but would easily do well in the dressage world or as a jumper. I expect him to mature 16.2+h. He is going grey. 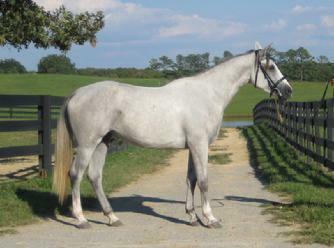 Double registered as a purebred Trakehner and half-Shagya. 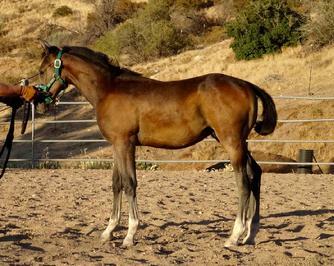 2012 USDFBC West Coast Champion Current Year Foal! Brigadier is Sterling's first purebred Shagya-Arabian colt. He will be grey. He looks like he will be a very large boy! I expect he will mature over 16h - is currently 15.3 h at 4 yrs of age. He has very large hocks, long legs. 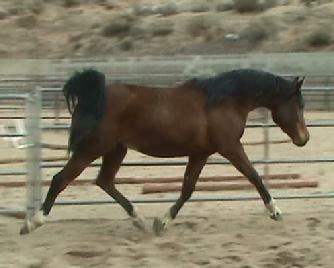 He is very uphill, is showing excellent movement with a fluid trot - looks like he can go far in the dressage world. He comes right up for attention. 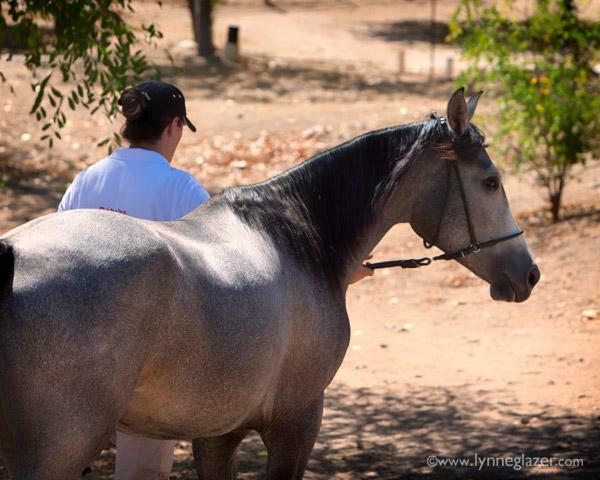 He has the very influential Elite Shagya-Arabian stallion Bajar through both his sire and dam lines. Bajar sired on Olympic eventer (White Girl - German Horse of the Year) and was used extensively in Warmblood breeding in EU. Brig should excel as a jumper! Brig was evaluated on the recent 2012 Shagya-Arabian Inspection where he scored a "9" for movement! One the Shagya judges remarked that he can go Grand Prix level. Brig was just taken to Janet Worts of Bucksnort Ranch to be started under saddle, after which he will be started in dressage by Sarah Lockman. His dam Brook is a very substantial mare, stands 15.2 1/2h. 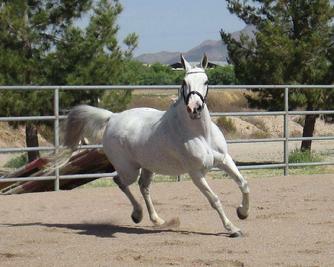 Her bloodlines go back to Hungarian Bravo (by *Pilot) and the imported mares *Arriva and *Aminah. 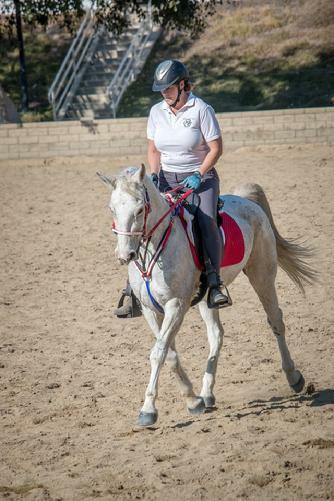 She has outstanding, powerful movement and has been started under saddle. Congratulations to Steve and Tori!!! Congratulations to Antonio of Mexico! Dudamel is a very easy colt to work with. Calm, friendly personality. He has outstanding movement, good bone and conformation. 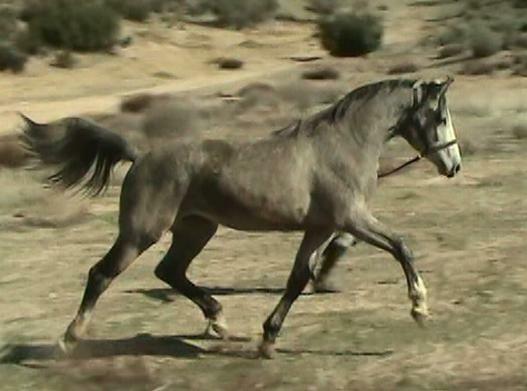 Double registered as 1/2 Arab and purebred Shagya-Arabian. Ideal for endurance! His dam is a racebred Polish arab. 2 of her daughters have been Trakehner approved. 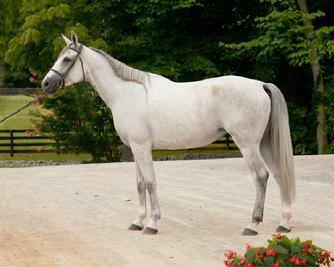 2011 USEF Region 1 Champion Horse of the Year for Anglo/Half Arab Halter! Nefertari has excellent potential for dressage, eventing, jumping or endurance. She will mature 16h. She has very large joints, good bone, well laid back shoulder and substantial hind end. She has a beautiful, refined head with small muzzle. 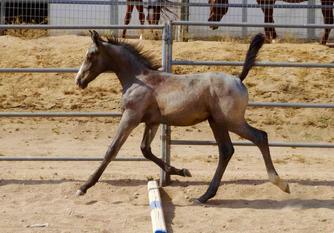 At 3 days of age she was showing us her beautiful, balanced movement. She has a curious personality, is easy to handle. She was recently evaluated at the 2012 Shagya-Arabian Inspection where she scored 9 for type, 8 for conformation, and 7 for movement. 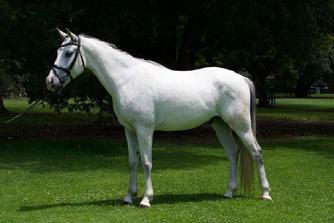 She is very similar to her full sister Nairobi who was the 2011 USDF Breeders Series Current Year Foal Champion. Her older sister Nike has been approved by the ATA. 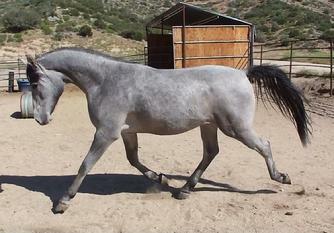 Ramius is a very sweet gelding with an endearing personality. 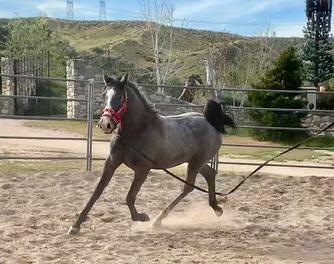 His trot has wonderful extension and suspension, is very willing, calm. 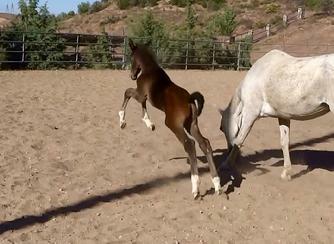 He will excel in dressage, eventing or jumping. He currently stands 16.1+h. 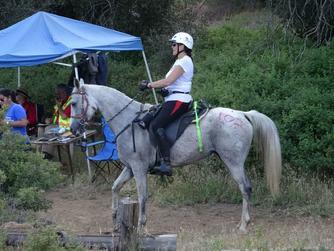 Ram has completed 2 novice NATRC ride (took 1st place at the second ride) and spent 60 days with Sarah Lockman Dressage. Ram is now in training for eventing. He did his first event after only 6 wks in training and placed 6th! Excellent disposition! Congratulations to Rachel of OR! "Robi" has been an extremely friendly filly from day one. She is easy to handle, very athletic with correct conformation, good bone, elegant, with very well balanced movement. She should mature 16 h. Her gaits are well-suited for dressage, although she loves to jump the ground poles in the arena. She is ideal for endurance. She has no purebred arabians in her 4th generation. She is a full sibling to Silver Nike SH. 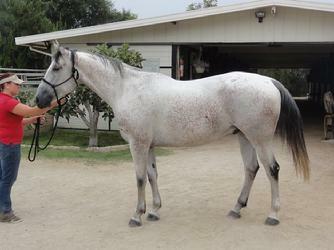 2011 USDF West Coast Breeders Series Champion Foal! Congratulations to Dr. Renetta Hatcher on her purchase of Reveille SF! Congratulations to Sarah of TN! 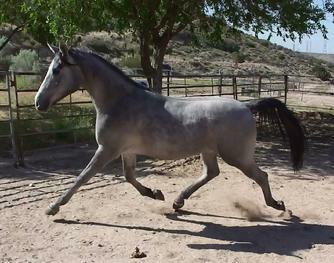 Silver Nike is an elegant filly with lots of bone. She will mature 15.3-16h. She is very light on the fore, uphill, with beautiful movement, and lovely extension and suspension. 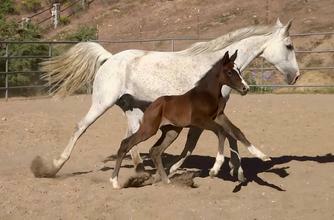 She will excel in dressage or be a valuable broodmare. She has no Arabians in her 4th generation. Nike is ATA approved! Congratulations to Dr. Renetta Hatcher on her purchase of "Heidi"! 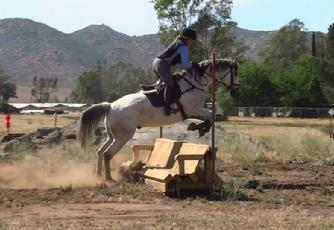 Highland Silver SH - she loves to jump! Highland Silver's dam is a daughter of *Roemer. *Roemer was the first horse inducted into the USDF Hall of Fame for dressage. "Heidi" is extremely friendly, has beautiful movement with good suspension and extension. I expect her to mature 16.1+h. She is bred for performance!